Your website is a marketplace, where your sellers advertise and offer goods for sale to your buyers. You may have negotiated special deals with your sellers. Your buyers must subscribe to your site to take advantage. This website terms and conditions template sets out the subscription process and the relationship between your business and buyers who use your website to buy. The goods bought and sold could be anything. They may be ordered via computer, smartphone, tablet or any other mobile device. 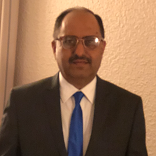 We have provided for basic contract procedures, but delivery information must come from the seller as it will not be the same for a tee shirt as for an item of industrial plant. You might specialise in one product, or you could sell a wide range of products. You do not need to have more than one seller client but we assume that you will. Most of your sellers probably use your services because they do not have an internet facility for taking money or because your marketing service is better than they could achieve. You are simply marketing and collecting money. This template should be used for a site that creates a marketplace for physical goods where the opportunity to buy is limited to subscribers. If you recognise your business model from the description below then the template should be suitable. The type of products sold is not important to this document provided the product is not a service or a downloaded good. Your site could connect buyers and sellers of small items such as mobile phones or wine, or larger items such as cars. If your site creates a marketplace for services, not for products, see Website terms and conditions template: marketplace for events; buyer side. If there are no restrictions on membership before purchase, then Website terms and conditions template: marketplace for goods; buyer side should be suitable. 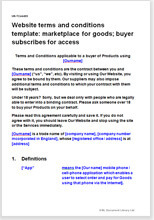 The complementary template that provides terms for sellers can be found at Website terms and conditions template: marketplace for goods; seller side. This template allows you to comply with the Sale of Goods Acts 1930 as amended. The Consumer Protection Act 1986, and other consumer protection legislation allowing your sellers to sell to businesses or consumers. Over 3,500 words of drafting notes to help you.